I had SO many ideas for this month's Dirty Dozen Gallery theme "For a Song", but not enough time to get them all done! So this week I played a little bit more, to get those ideas OUT of my head and finally onto paper. 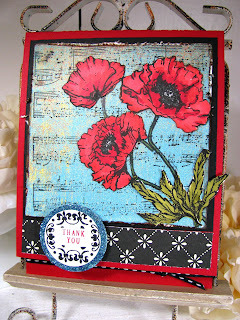 I'm obsessed with this Flourishes Poppy stamp set, so I thought it would be fun to combine it with my cool Unity Stamp Co. "Worn Music" background. This background stamp is SO cool...its stamps really DISTRESSY! 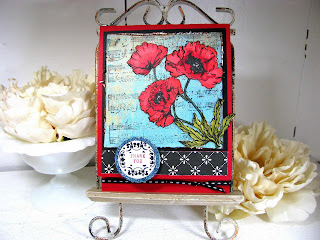 I used it over the top of some old basic grey blue paper from my scrap bin to give background color, and then cut out poppies to put over the top of it. Still playing with my Justrite 1-3/16" round monogram with the damask borders! This time I used glitter around the monogram to make it pop off the card! Supplies: October Afternoon "Hometown" black paper. Copic markers "Prawn" and "Lipstick Red". Flourishes Poppy Set, Unity Worn Music Background, Justrite 1-3/16" round monogram, damask. Beautiful card, Lisa! I love that background stamp, too! SHUT UP! Lisa, these are FABULOUS!!!!!!!!! !